Plaintiffs are Jason Cross, also known as Mikel Knight, a country rap artist, and two entities affiliated with him. Defendant is Facebook, Inc. (Facebook). The dispute arises out of a Facebook page called ―Families Against Mikel Knight,‖ which page, plaintiffs claimed, incited violence and generated death threats against Knight and his team. Plaintiffs sought to have the page removed, Facebook refused, and plaintiffs sued, in a complaint that alleged six causes of action. Facebook filed a special motion to dismiss all six causes of action, arguing that they arose from protected activity and that plaintiffs could not show a probability of prevailing on any of them. The trial court held that the complaint was based on protected activity, that plaintiffs could not prevail on the first three causes of action, and granted the anti-SLAPP motion as to them. The trial court denied the motion as to the three other causes of action—claims alleging statutory and common law claims for violation of Knight‘s right of publicity, along with a derivative unfair competition law (UCL) claim—concluding that Knight had shown a probability of prevailing on them. In order to promote his work, Knight’s marketing efforts included hiring of independent contractors who would travel throughout the country in vans that featured Knight‘s name and logo, promoting his music and merchandise. On June 9 and 16, 2014, two vans were involved in separate accidents when the drivers fell asleep at the wheel. The accidents had tragic consequences, including two deaths and one serious injury. Shortly after the accidents, a publicly available Facebook page called ―Families Against Mikel Knight‖ was created, apparently by a person (or persons) related to the victims. As to plaintiffs‘ version of what followed, their brief describes it this way: ―numerous commenters began posting statements inciting violence and death threats against Knight and members of his record labels . . . . Because of these comments, numerous members of Mr. Knight‘s promotion team were verbally threatened and physically assaulted. 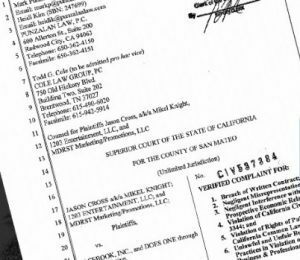 [¶] In addition to these threats and assaults, the unauthorized Facebook page also severely impacted Knight and 1203 Entertainment‘s business deals. In 2014 and 2015, Knight was in negotiations with numerous companies to sign lucrative deals involving his music. But once representatives from these companies, which included Nielsen SoundScan and the Dallas Cowboys football team, reviewed the content of the unauthorized Facebook pages, they backed out of these negotiations.‖ Sometime in late 2014, Knight informed Facebook of the comments and threats. And on June 5, 2015, Knight‘s attorney sent a letter to Facebook demanding that it remove the pages. Facebook refused. A lawsuit followed which alleged six causes of action, styled as follows: (1) breach of written contract; (2) negligent misrepresentation; (3) negligent interference with prospective economic relations; (4) breach of Civil Code section 3344; (5) violation of common law right of publicity; and (6) unlawful and unfair business practices, Business and Professions Code section 17200 (the UCL claim). Facebook filed a demurrer, and a special motion to strike (anti-SLAPP motion). The anti-SLAPP motion contended that the complaint arose from the exercise of the constitutional right of free speech in connection with an issue of public interest, and that plaintiffs could not show a probability of success for two reasons: (1) the claims were barred by the Communications Decency Act; and (2) even if not, the claims were not viable under California law. Finding that the lawsuit involved an issue of Pubic Interest and that the Plaintiff failed to demonstrate a likelihood of prevailing on the merits of their claims, the Appellate Court affirmed in part and reversed in part and remanded the case to the trial court with instructions to (1) enter an order granting the anti-SLAPP motion in its entirety and striking the complaint, and (2) hold a hearing, following further briefing, to award Facebook the attorney fees to which it is entitled under section 425.16. This entry was posted in Cases and Comments about Social Media, Legal and tagged anti-SLAPP, CCP 425.16, facebook, Mikel Knight, papplaw, SLAPP by ericpapp. Bookmark the permalink.